EASTER ITEMS ARE HERE AND GOING FAST, ORDER EARLY!! HAMS WILL KEEP IN YOUR REFRIGERATOR! !! !WARM WEATHER SHIPPING ALERT, PLEASE READ!!! We have the right to change a shipping method, from ground service to air service if we feel it is necessary to protect perishable products that are being shipped to a warm climate state such as Florida, California, Arizona, Texas, etc. or any 4 day transit areas. This will increase the price so choose 2 day air at checkout to get the closest shipping estimate and make your order worth the cost. 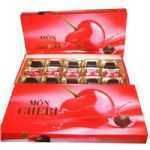 MON-CHERI 20% OFF 157g BOXES!! 20% OFF BAVARIA Tee'S & SWEATSHIRTS USE CODE "MINE"
CHECK SUPER SALE ITEMS: ON SALE SECTION! Authentic as it gets because that's the only way our Bavarian Master Sausage makers know how to make Old world German sausage! Made right here in our sparkling clean USDA Federally inspected "Wurstkuche" (sausage kitchen) in Madison Wisconsin. No Artificial colors, flavors, gluten, fillers, liquid smoke, additives, preservatives (except for nitrite in our smoked products) or chemicals and NO MSG are ever used in our products. "A TASTE FROM HOME! " 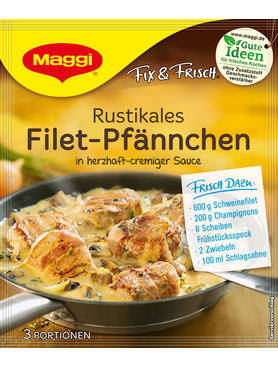 Family owned and operated for over 53 years, we use Old world family recipes that were brought to this country from Schweinfurt Germany, and are still mixed by hand from traditional bulk spices. By using only the finest and freshest ingredients, we are able to guarantee Authentic products with a true taste from the "Old Country". 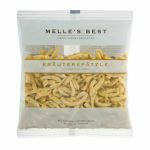 From Our Kitchen To Yours - items like Munich Weisswurst, Nurnberger Bratwurst, Knackwurst, Leberkase, Sauerbraten and so much more - we also offer everything you need to compliment these Old World German meat products, such as Brotchen and Pretzels from Munich, kraut, cheese, mustards, etc. Over 1,500 products are available to order online! When visiting Madison Wisconsin, be sure to stop in our Bavarian Chalet, where we look forward to greeting and serving you with our finest German hospitality. 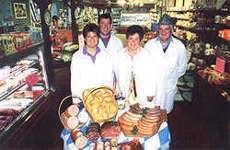 Whether ordering from our secure online shop, or in our retail meat market, we want to make your "Old World Germany" experience a memorable one! 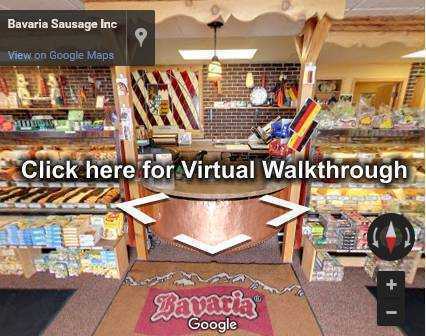 WALK THRU OUR VIRTUAL STORE HERE IN MADISON WISCONSIN! AUTHENTIC OLD WORLD GERMAN SAUSAGE, perfect for Oktoberfest / Octoberfest celebrations, from Our Kitchen to Yours! 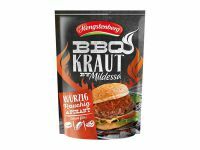 Over 1,000 Authentic German Foods and Specialty German Meat Products, including Munich Weisswurst, Rouladen, Sauerbraten, Schnitzel and Leberkase, and Hundreds of Wisconsin Cheeses & Imports, available for shipping within the U.S., from the Bavaria Sausage Secure Online Shop! 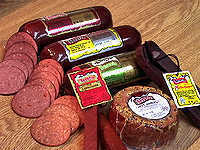 The 50 year tradition of "Just Pure Meat" is a key factor for satisfied Retail and Wholesale customers of Bavaria Sausage & Cheese Chalet, of Madison, Wisconsin. 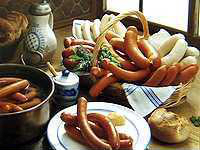 Bavaria Sausage, Inc. has been recognized throughout the Meat Industry for Superior Quality Hand-Crafted Meat Products and are known throughout the country for their High Standards as Producers of Specialty German Summer Sausage, Bratwurst (Weisswurst, Knackwurst, Wieners, Nurnberger & Rostbratwurst), and Landjaeger. 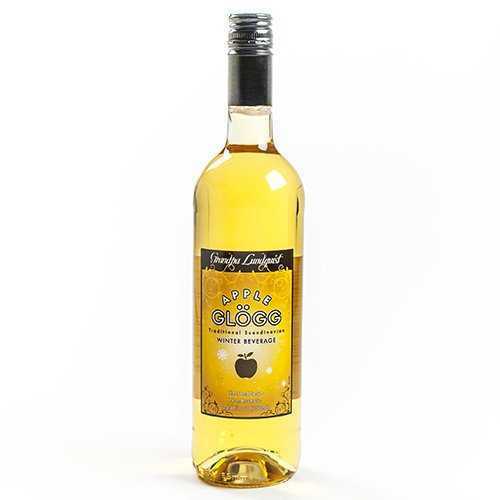 Wholesale is available to Restaurants, Country Clubs, Schools, Clubs, Fundraisers and small Mom and Pop stores. 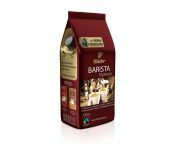 We will never sell our products to Big Box stores. Page Summary: Authentic Old World German Sausage, from Our Kitchen to Yours! 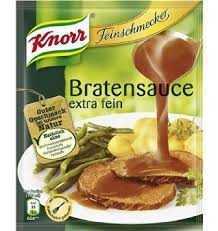 Over 1,000 Authentic German Foods and Specialty German Sausage Products, including Munich Weisswurst, Rouladen, Sauerbraten, Schnitzel and Leberkase, and Hundreds of Wisconsin Cheeses & Imports, available for shipping within the U.S.